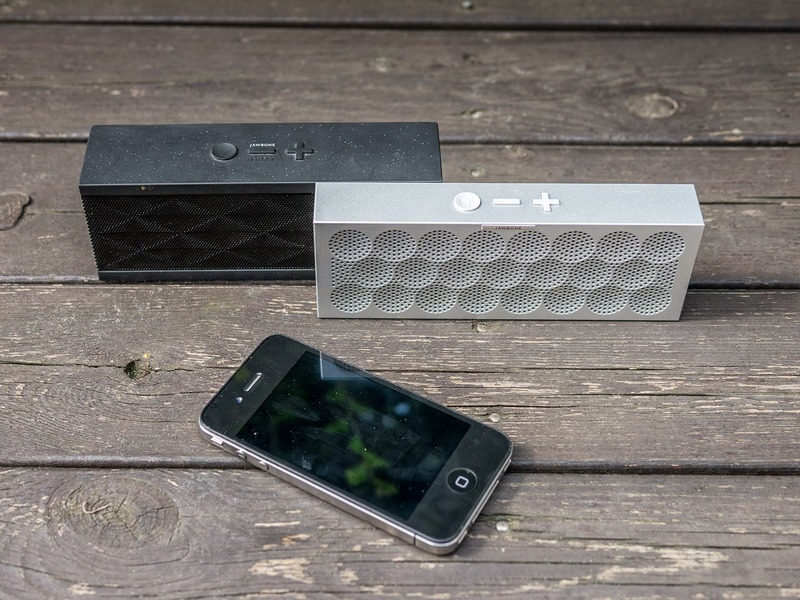 Oluv's Gadgets: Review: Jawbone Mini Jambox - the better Jambox? We all know that the Jambox is just a piece of overpriced garbage... well the truth is, the original Jambox was nevertheless something like a game-changer for the whole portable speaker market. Up to then all portable speakers were either small and sounded tinny, or they were too large to really be called "portable". When the Jambox was announced about 3 years ago, there were hardly any comparable speakers available. The Jambox was overpriced for sure and it should have cost half of its original price already from the beginning. Even before the Jambox and something like its inofficial "father" there was already the FoxL from Soundmatters, but it never became as popular as the Jambox, which I never understood. 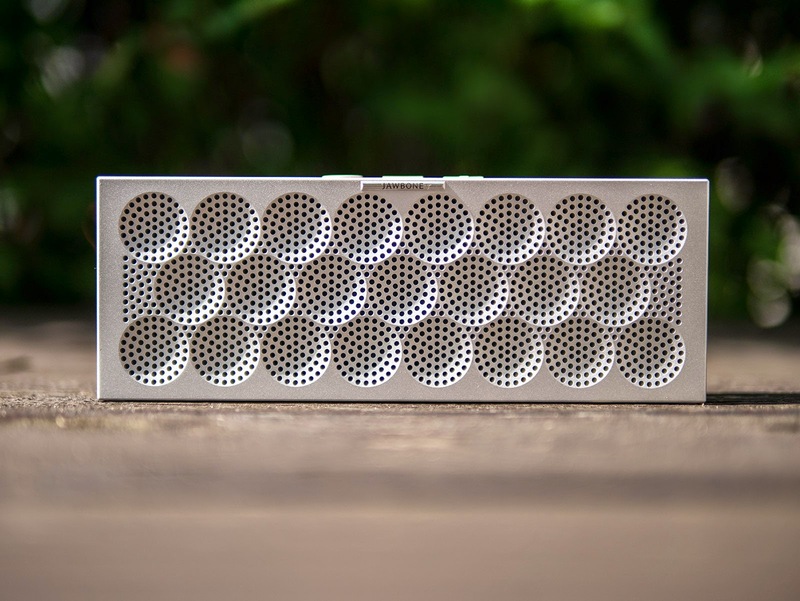 Maybe it was the design of the Jambox, which made it look like anything else than a speaker, but I didn't care much about the strange Steve Behar design and all these regular geometric patterns, I really never liked nor did I understand them. Therefore I understand even less, why so many copycats tried to use similar patterns for their speakers, meanwhile there are so many cheap replica on the market that try to look like a Jambox, which looks just ugly in my opinion. A simple metal grille would look much more elegant in most cases than all those patterns. I compiled a quick collage of some examples that are just brash copies of the original design, some look extremly close! In reality the Jambox didn't sound that good, but it managed to create a more full-bodied sound than the small size would suggest. 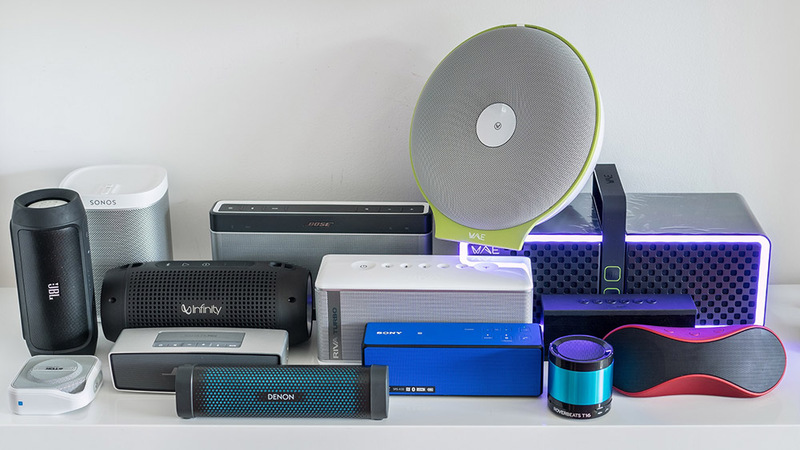 Thanks to its acoustic design from Soundmatters with their "twoofers" and the back passive radiator being actually the battery, the Jambox was able to produce a fuller sound than most other even larger speakers. But it was far from perfect, it didn't play very loud, all samples I have tried had some resonance-issues with particular frequencies (see my teardown here, where I tried to fix it, but never really succeeded) and if we compare the Jambox to the Bose Soundlink Mini today, which is only slightly larger, the Jambox sounds like a toy. 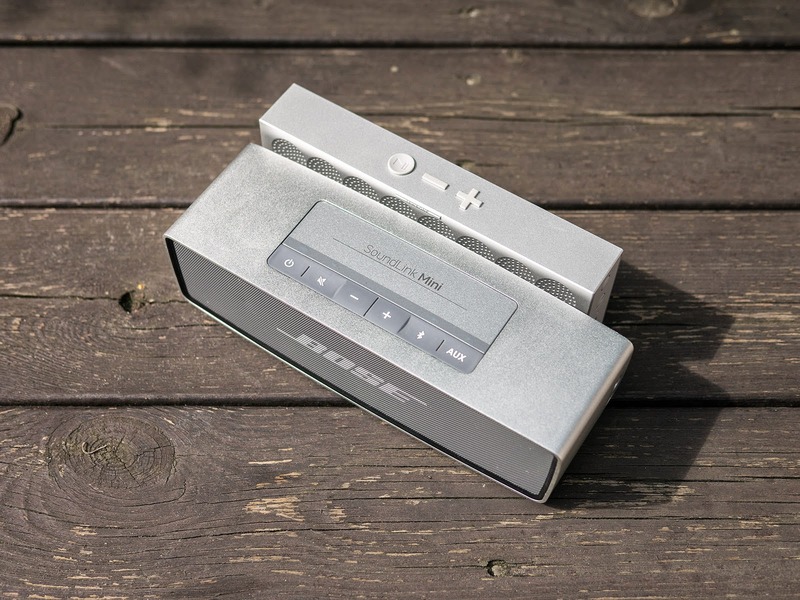 Bose finally showed last year with the arrival of the Soundlink Mini what kind of sound is achievable from a speaker that small. They had already showed off big sound in small speakers like with their Computer Music Monitors, and my hope was that one day Bose might make a portable version of it. They didn't, but surprisingly designed a completely new speaker: the Soundlink Mini. 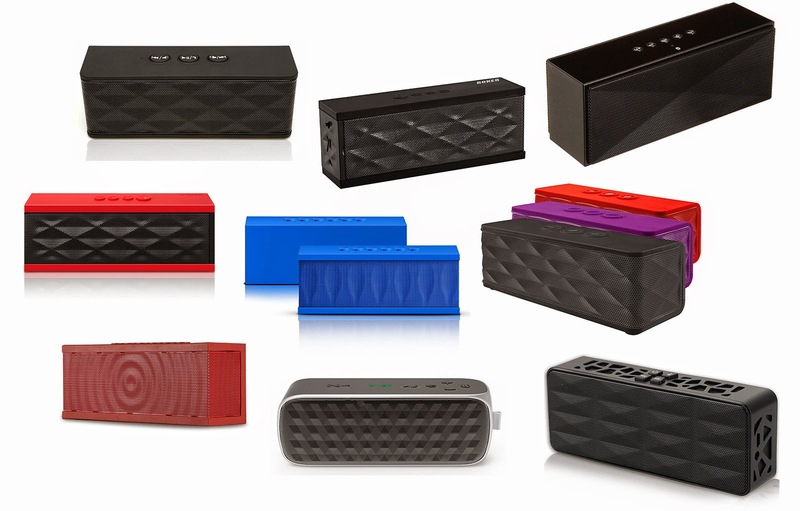 Since then the Jambox had hard times to survive, the price dropped and now Jawbone finally discontinued it. 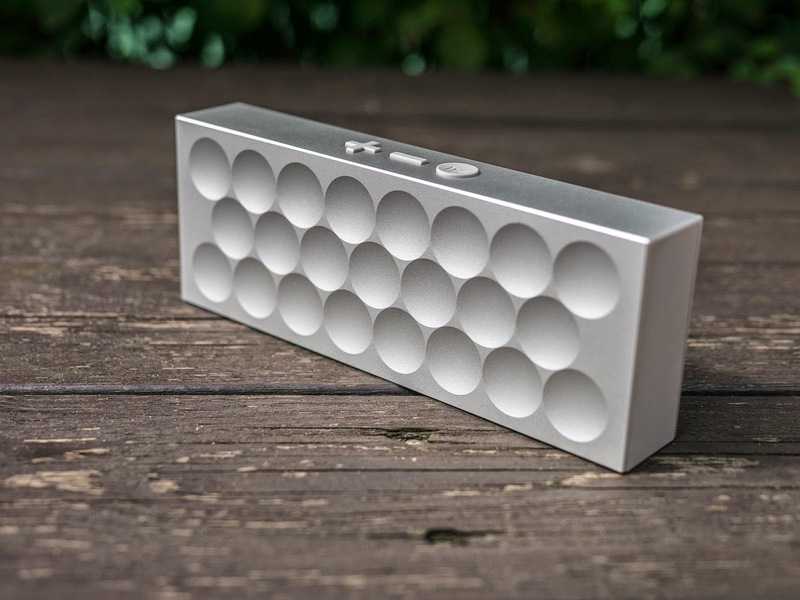 You won't find the original Jambox on their site anymore. Suddenly all copycats started to copy the Soundlink Mini, but so far I have not heard a single one which would come even close, despite all the criticism about muffled sound or boomy sound, the Soundlink Mini remains a pretty unique sounding speaker that small. The only speaker that might have an edge over the Soundlink Mini, although still not perfect, is the new Sony SRS-X3 that I reviewed here. Unfortunately the Sony is even slightly larger than the Soundlink Mini. What is missing though, is a really portable solution, smaller, lighter, but still being able to produce a convincing and full-bodied sound. I tried many ultraportable speakers, like the JBL Micro Wireless, the TDK Trek Micro,... and although they sound quite acceptable for their size, they are still far away from impressive sounding. 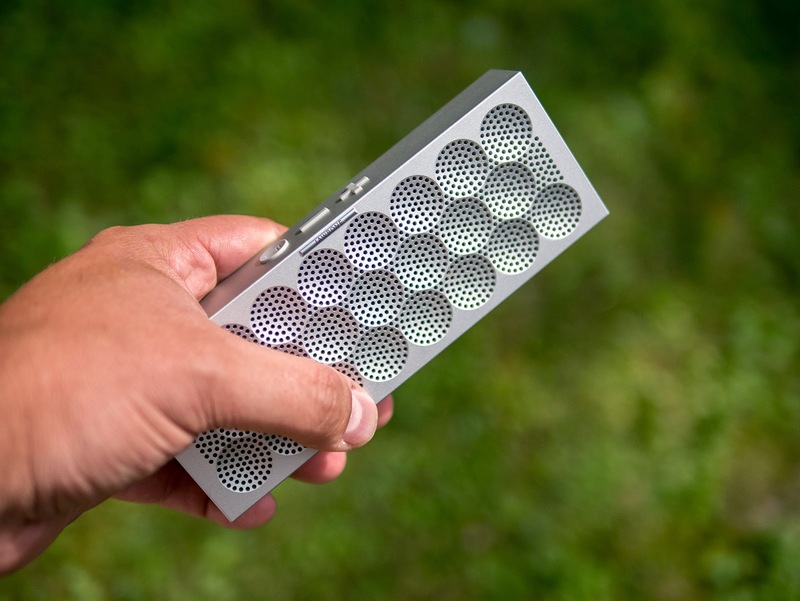 In the meantime Jawbone had announced the Mini Jambox, a smaller and lighter version of the Jambox, and they had the chance to really improve things and make the speaker something outstanding. The Mini Jambox didn't seem to be the success Jawbone had expected, so the price fell pretty quickly too, and when the price jumped below 100€ I finally grabbed one to try it out and compare to some other speakers I currently had at home. Designwise the Mini Jambox is a huge improvement over the old design. Not only the Mini Jambox is roughly half the size of the original Jambox, it is the aluminium body, the clean and polished look, and altough I still don't like most of the offered patterns ("diamond", "graphite", "snowflake", etc), the dottet one looks best and together with the neutral silver color the Mini Jambox manages to look just as classy as the Bose Soundlink Mini. But what can you expect from something that small? The Mini Jambox is full of useful features that I would like to elaborate on a little bit and as my neighbour still owns the old Jambox, I also wanted to see if the shrinking made the sound much worse or maybe even improved some things? What I really love about the Mini Jambox is its size. It is even smaller and lighter than the FoxL which I often carry inside my trousers pocket if I need a portable speaker. Usually I would have loved to take the Soundlink Mini instead, but it is just too large to really be packet away without being noticed. This is where the Jambox fits the bill. It slips into my shirt-pocket and I don't think about it anymore. It weights nearly 100grams less than the old Jambox and slightly more than 1/3 of the Soundlink Mini. I especially like some of its features. The Mini Jambox supports multipoint pairing through Bluetooth and it is the first speaker I have tried where this functionality is finally implemented well. The Jambox Mini automatically reconnects to all already known devices unlike many other speakers where you have to force Bluetooth connection every time again. 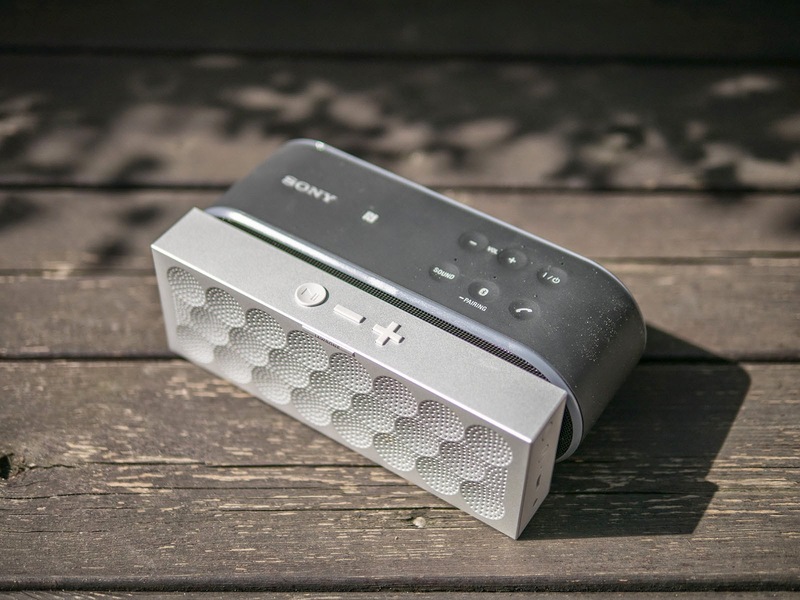 On the Mini Jambox this means that if you are already connected to it streaming some music and your wife comes home her mobile phone will automatically pair to the Mini Jambox as well and you will hear a confirmation beep. Now your wife could start playing some music, then your playback will be automatically stopped! Really cool, no need to reconnect, repair, or stop music. Just press play, and you can switch from one device to the other. 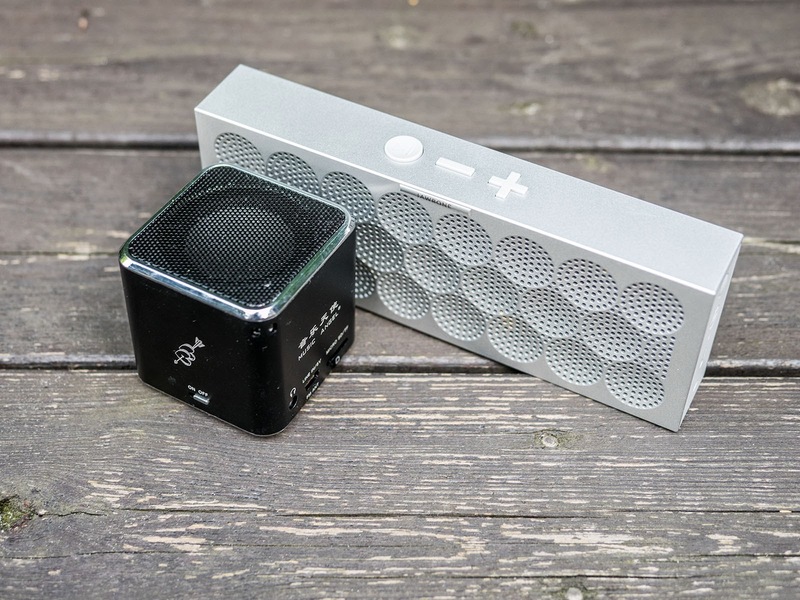 The Mini Jambox also supports wireless pairing with another Mini Jambox, Jawbone calls this Multiplay, which is possible in either unisono-mode or real stereo. I haven't tried that yet, but I am sure it should enhance listening experience even further. The pairing process seems pretty straight forward as you can see here. Other new features include track control through the Play/Pause button, which was somehow missing on the old Jambox. With double press you can switch to the next track, three presses will take you a track back and you can of course take calls with the same button, as handsfree is built in as well. This is quite nice, as you can do nearly all directly from the Mini Jambox without having to touch your mobile phone at all as even the volume is now synced between the devices! Really helpful and how it has to be done in a Bluetooth speaker! Thank godness the Mini Jambox also has the "silent mode" which turns off all sounds and voice-prompts. 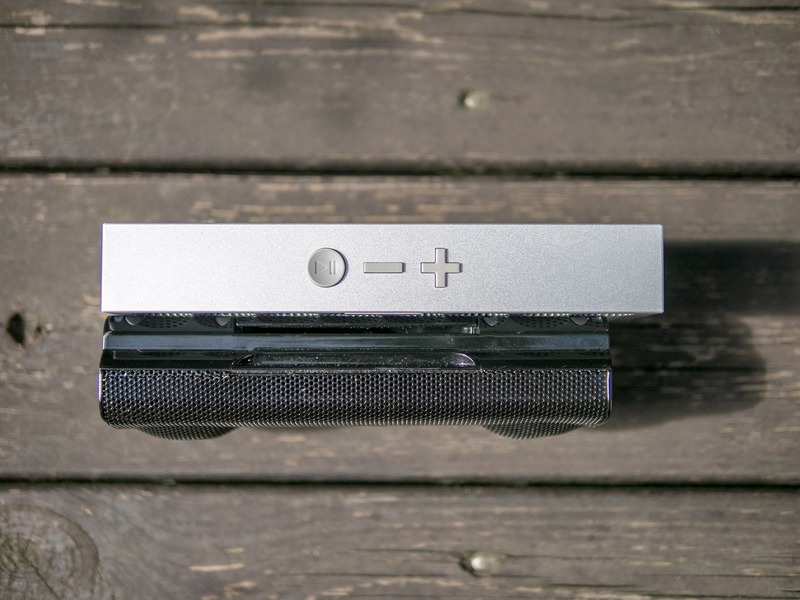 You enable it by keeping the play-button and minus-button pressed simultanously before turning the Mini Jambox on. Strangely the Mini Jambox will still hum with a deep bass note when turned on or off even sounding slightly distorted! I was very curious to hear how the Mini Jambox sounds, as I have never heard it in person yet. The Mini Jambox seems to use the same new slim drivers of the FoxL Dash7, otherwise such a compact body wouldn't be possible. The battery is still acting as passive radiator, but it is forward firing this time, making the back completely closed without any grille but with the same front-pattern. Allthough bass is rather non-directional it is still better to have it emit directly frontally rather than to the back, like it was on the old Jambox otherwise you would always need some back-wall to reinforce it, because when standing completely free it would rather get lost in the distance. 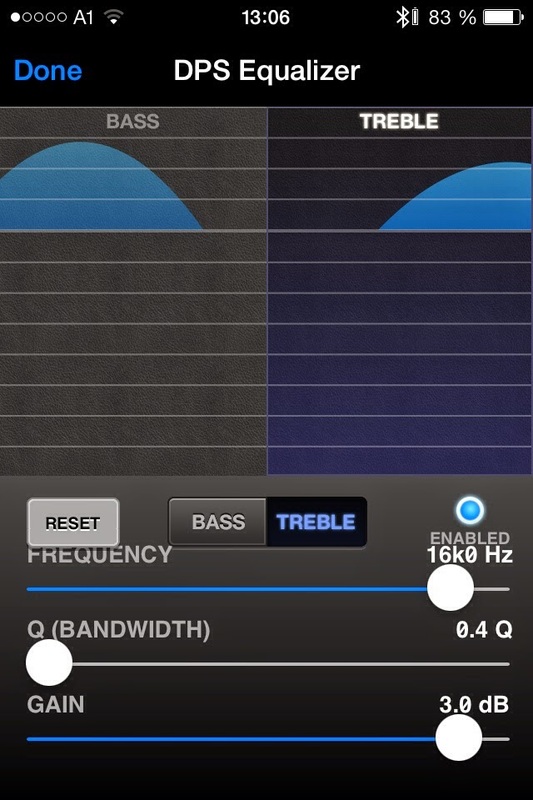 According to Jawbone there is a DSP on board now, that's why the sound is so "incredibly rich" at lower volumes. Well, in reality it is everything else than rich. My impression was that it sounds like an old muffled transistor radio when I played some first tunes. 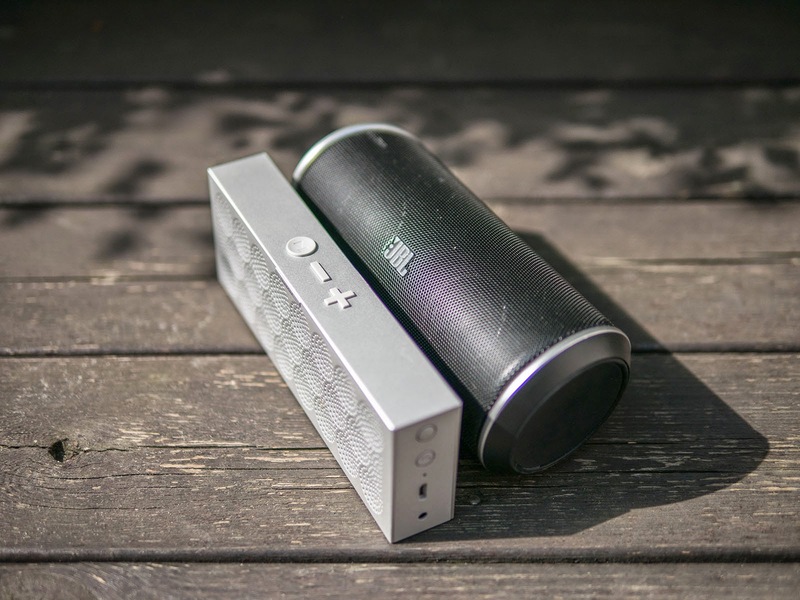 The loud power on tone will sound more powerful than every music you throw at it and the Mini Jambox sounds even more veiled than the Bose Soundlink Mini. Especially at low levels I could hardly hear any of the claimed richness. Now comparing the Mini Jambox to the original Jambox, the differences are not huge at the first look. 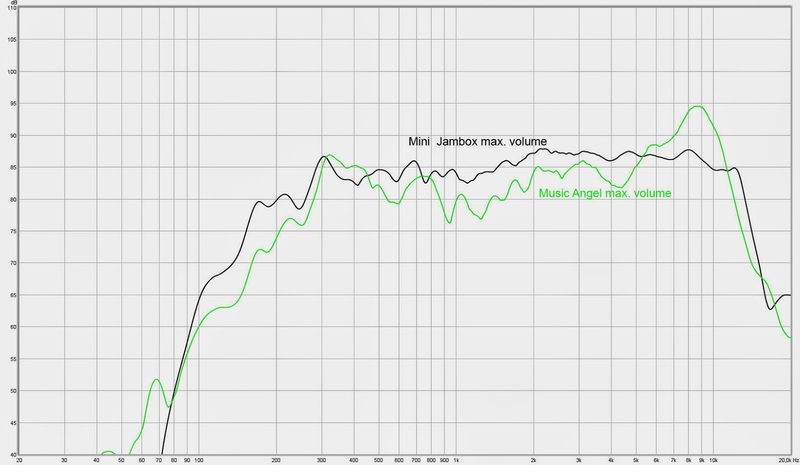 The old Jambox doesn't have this strong treble roll-off, but it has quite a big dip at 12kHz. This could be interpreted as a big advantage for the Mini Jambox being able to produce similar audio despite being nearly half the size, or also a big letdown because the Mini Jambox is not able to offer that much improvement over the old version. In reality it is indeed an improvement. Although both still sound pretty similar, the Mini Jambox sounds less stressed with a more solid sound, while the old Jambox sounds rather compressed and somehow dirty. This is especially noticeable at higher levels on the old Jambox, where you will hear distortion creeping in already far below maximum, while the Mini Jambox will overall sound cleaner. 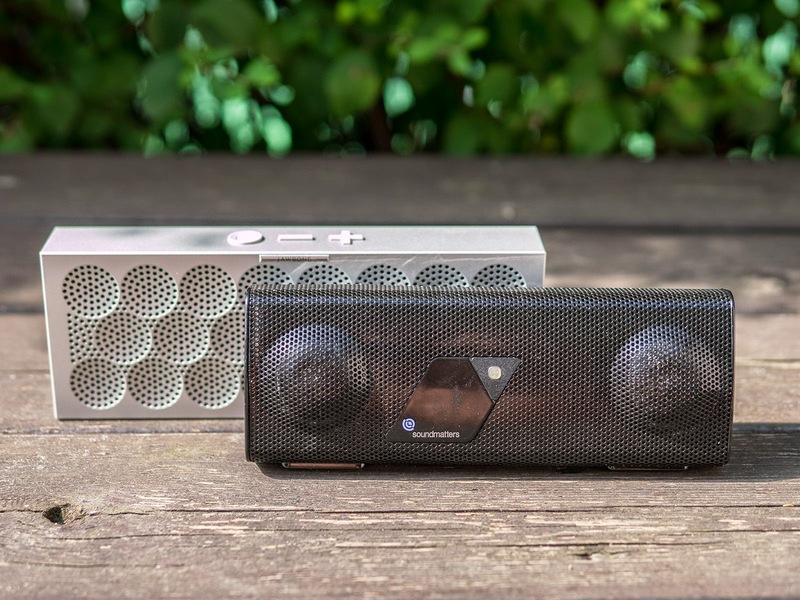 Both have a comparable maximum volume, depending on the music either the Mini Jambox or the old Jambox can be slightly louder. But while the old Jambox compresses dynamics to achieve a higher maximum volume (similar to what Bose does with the Soundlink Mini at levels above 75%), the Mini Jambox remains without that obvious dynamics processing resulting in a more natural sound but with slightly less bass at the same time. With some tracks you might even notice pumping effects with the old Jambox, which means that the whole music suddenly becomes lower when a bass sound is played to become louder again when there is no bass anymore. I haven't noticed anything like that with the Mini Jambox. 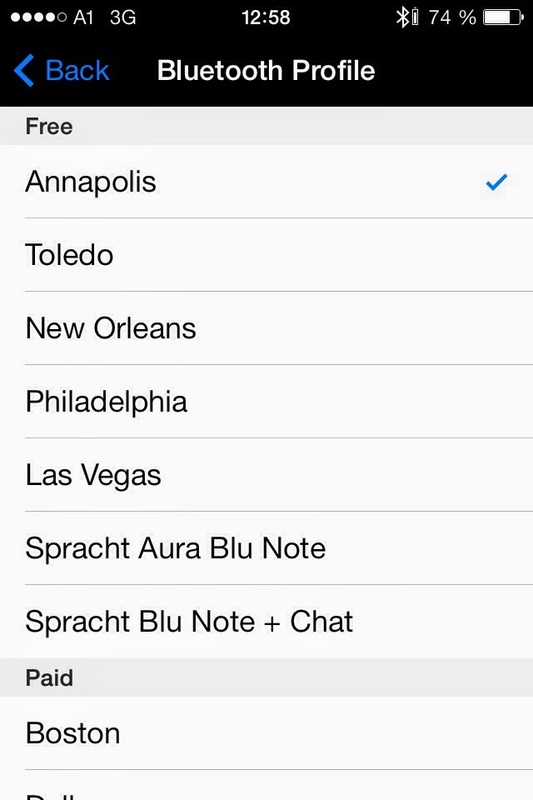 Things change a bit if you enable "Liveaudio". Liveaudio does not only open the stereo-image quite much, but it has also some influence on the overall frequency response. With Liveaudio the Jambox gains quite a bit of bass and it becomes clearer with higher frequencies at the same time. The difference doesn't look serious from the graph, but including the enhanced stereo-field the sound becomes much more profound and large. I think it is especially the BACCH crosstalk canceling filter (this is what Liveaudio is based on) which adds to the overall effect. 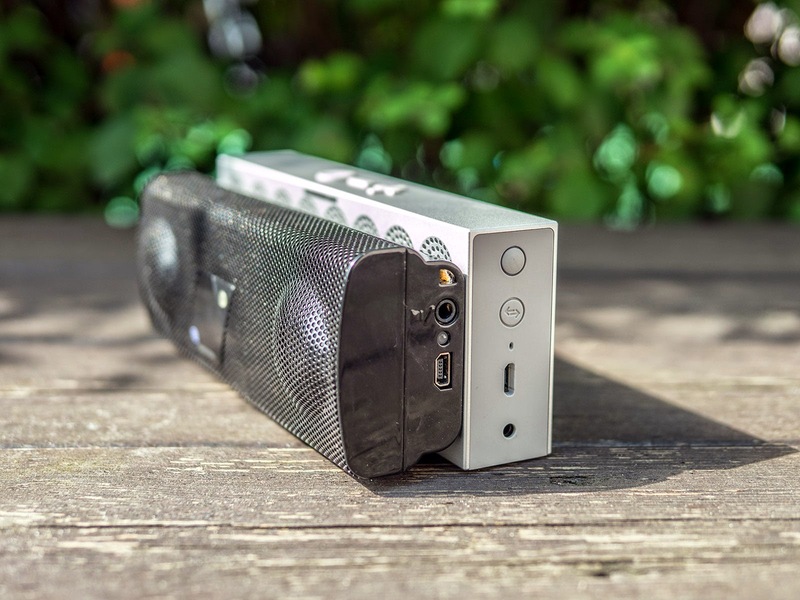 The Mini Jambox seems the first speaker where Liveaudio really is a benefit, assumed the listener and the speaker are located at optimum positions. I have tried Liveaudio on the old Jambox and on the BIG Jambox, but neither of them was sounding that convincing as the Mini Jambox. Maybe the filters were tuned even better now, or the drivers are just better in the new version, because with the old Jambox I got pretty heavy resonance issues when I tried to listen to some music with Liveaudio turned on. Liveaudio usually works best with binaural recordings, it works with normal stereo-recordings too, but you might get overly exaggerated stereo-effects. With binaural recordings the effect will be outstanding and very realistic though. I have listened to some nature recordings and with the Mini Jambox placed directly in front of me I got the impression of being totally surrounded by sound, it is more impressive than a 5.1 surround setup. 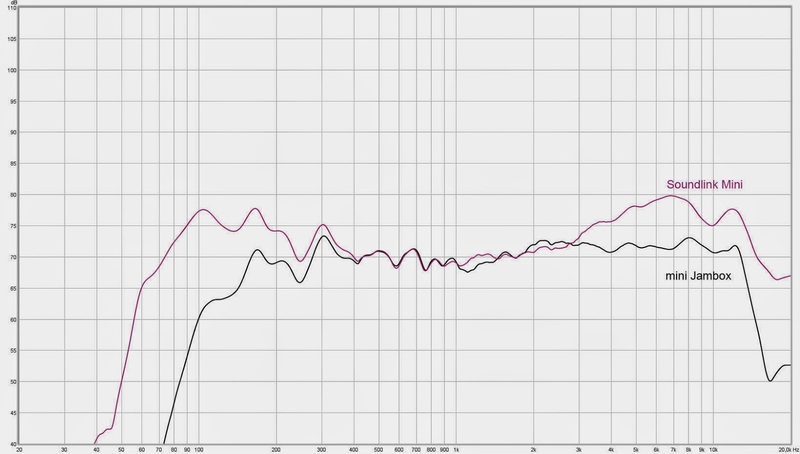 I didn't experience lots of back-localisation, but the sound comes much farther from beyond the speaker edges, than most other stereo enhancing algorithms I have heard so far. The best distance seems to be around 50cm from your ears. You can also try longer distances up to 1 meter, but 50cm seems to be the sweet spot. For biggest effect just lay down on your couch and place the Mini Jambox on your belly. You will probably have to lay it down flat, otherwise it won't stand upright, except if you have a hard and flat sixpack. Now play some binaural recordings like the youtube video above, or listen to Ottmar Liebert's "Up Close" which was recorded with a real dummy head, and enjoy! Thanks to Liveaudio finally binaural recordings can be enjoyed through speakers as well, otherwise binuaral stereo only worked well with headphones. The problems start when the speaker is not placed optimally anymore. Turn the Mini Jambox away slightly so that the drivers are not facing you anymore and you will notice that the mix starts sounding different. Reverb effects become more pronounced, background sounds might become too loud. Keeping Liveaudio on whole the time is not a solution if you just want to place the Mini Jambox somewhere and walk around, as it will really only sound good when placed in front of you at the perfect distance or close to it. Another issue is Liveaudio introduces a slightly lower maximum volume, this is probably due to the crosstalk filtering, which has to compensate for some frequency loss and therefore boosts several frequency bands to avoid sound colorations. 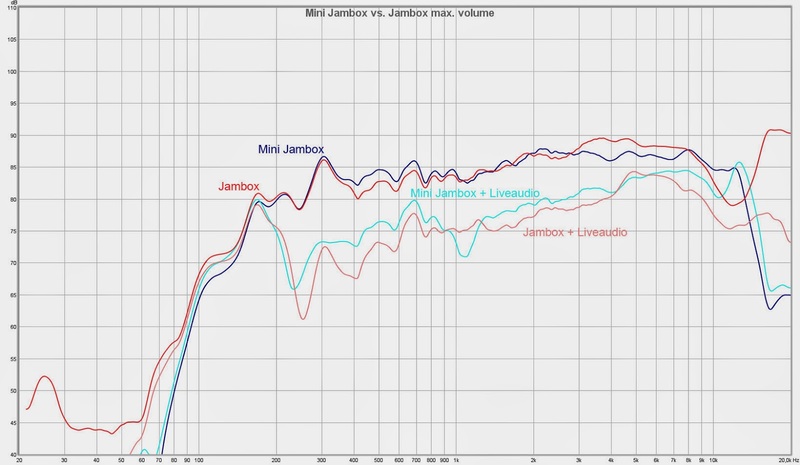 It is not that severe as on the old Jambox which became about half as loud with active Liveaudio, but on the Mini Jambox Liveaudio will still give a slightly lower maximum volume than without. When switching between both settings you will also notice how the volume-bar on your player jumps up or down, as Jawbone tries to match both levels not to make this difference that obvious. It is just at maximum volume, where you cannot match them anymore. 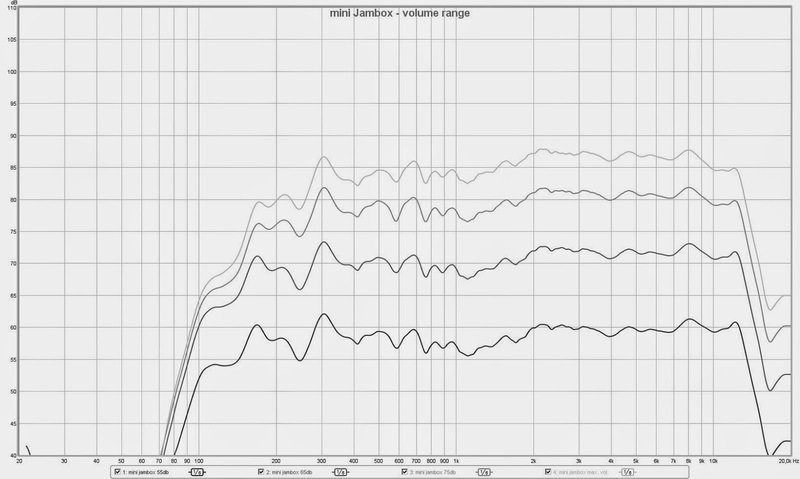 A bigger issue is that the Mini Jambox cannot reach a very high volume at all. Good thing is, the Mini Jambox doesn't show any distortion issues even at top volume. Some reviewers seem to have noticed mid-frequency distortion, but I found the Mini Jambox to play very clean up to its maximum volume. The old Jambox was much worse in this regard as it showed both distortion and stronger dynamic processing while not being able to play louder at all. But meanwhile most comparable speakers play nearly twice as loud, like the JBL Flip for example. Even smaller mini speakers like the JBL Micro wireless will play louder than the Mini Jambox and just for fun I even tried putting a cheap Music Angel which you can already get below 10$ against the Mini Jambox, and although the Music Angel sounds pretty harsh and by far not that balanced or full bodied, it will play nearly equally loud, which is a bit embarassing if you ask me. For a better view I normalized the graphs for all volume levels shown above, and you can indeed see slight differences in the amount of bass and treble depending on the volume, but from 65dB down to 55dB there is less than 4dB of bass increase, and while 55dB is already quite a low volume, the frequency response seems most linear at this level only to further reduce bass and treble at higher volume settings. In my opinion it should be the other way round, more bass-boost at lower levels, and a rather linear response at 75-85dB. As the sound of the Jambox is quite thin on its own (missing any deeper bass frequencies) it will give an even thinner impression at low levels, due to the human ear becoming less sensitive for lower frequencies at low amplitudes. There should be much more of a bass enhancement at lower levels than now. You rather get a bass-reducer at high levels, than a bass-booster at low levels. 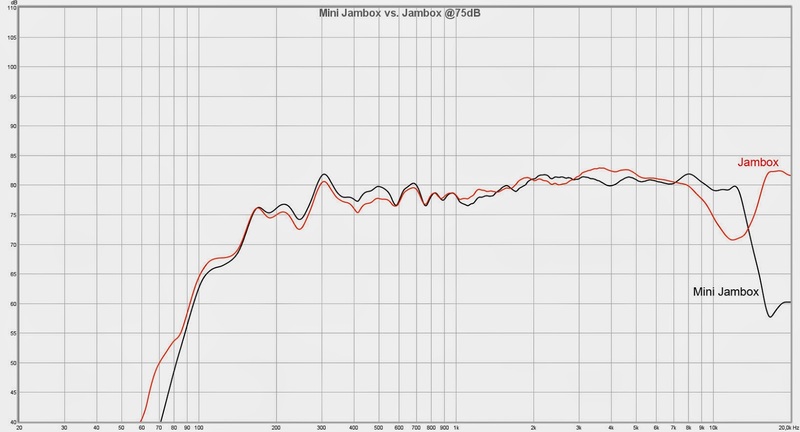 It is only when directly compared to the old Jambox or the FoxL, that the Mini Jambox sounds slightly more full-bodied at lower levels (the example below was measured at 55dB). Here you can really notice an advantage for the Mini Jambox and that the dynamic processing although subtle does its job. 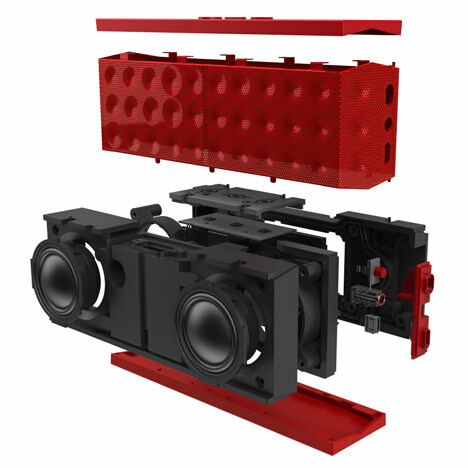 With this setup the Mini Jambox will sound fuller and larger and it will even play slightly louder than without any processing. Of course processed like this there might be some slight distortion introduced on very bassheavy tracks when played at higher levels, but overall distortion is still pretty well under control, what surprised me most. Such a strong bass-boost would not be possible with the old Jambox, because the whole body would buzz and rattle. However Bongiovi is better suitable for lower levels, as a kind of poor man's loudness function, which unfortunately is not dynamic. Of course one can go even further and try using Bongiovi together with Liveaudio for maximum effect, this will result in a really BIG sound and interestingly obvious processing artefacts or stronger distortion are still missing, at least if you don't exaggerate setting the volume too high. 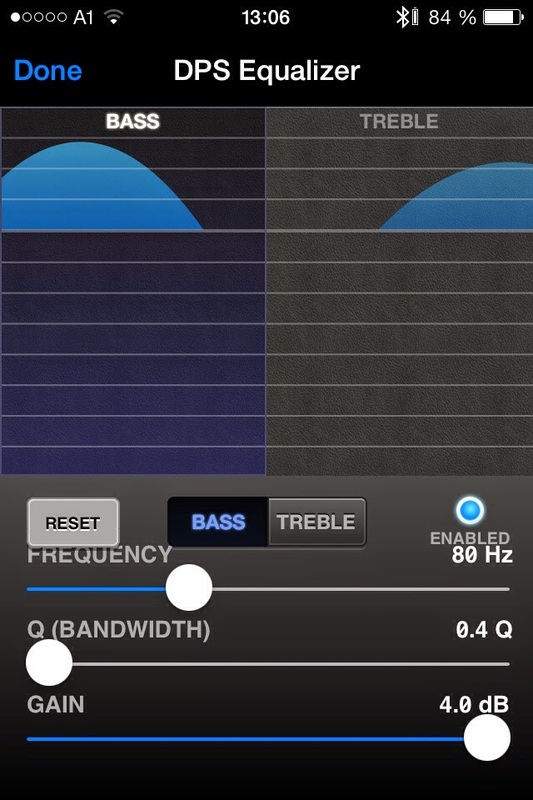 I also experimented with flat positioning which can boost bass even further on particular surfaces. 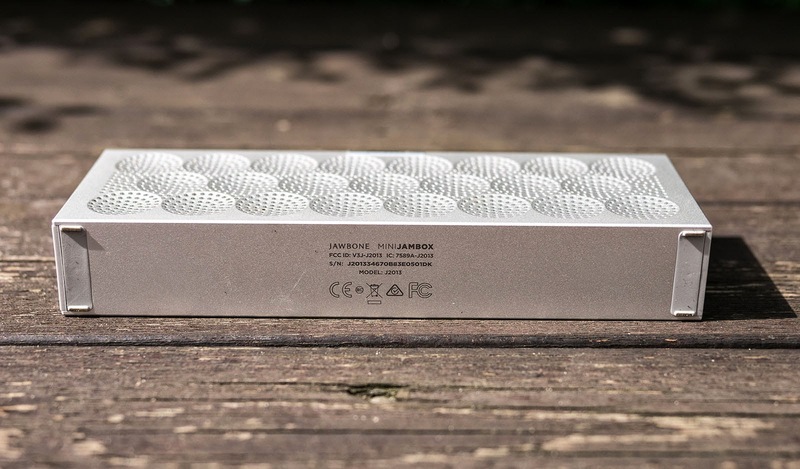 It is a pity that Jawbone didn't think about this feature and made the back-side completely rubbered, because due to the single passive radiator the Jambox can vibrate slightly. When laying flat it tends to rattle against the base at higher levels, some cloth or fabric below will help to avoid any rattling. The vibration is not as strong as with the old Jambox btw. and I didn't notice any problems with stonger creeping or dancing around, the Mini Jambox usually keeps its position, but the bottom surface only has 2 little rubber feet, which are not enough to securely keep the Jambox stable on uneven surfaces. I tried positioning it on concrete several times and I could feel how the aluminium was touching the base, instead of the rubber feet. The whole bottom should have been one big rubber foot, because as it is now any less smooth surface might scratch the body from below, especially at higher levels, where the Mini Jambox starts to rattle against the base. I think as personal speaker and not so much as party speaker the Mini Jambox can mostly convince. It won't give you the heavy sound of Bose, but with enabled Liveaudio and the right recordings it can sound very appealing. I would have only preferred some stronger sound adjustment at lower levels. But even now the Mini Jambox sounds better than most models from the competition that are by far not as portable and compact. I found the Mini Jambox to sound more natural than the JBL Flip which has an extremly boosted treble, while having even worse bass extension despite being larger, on the other hand the JBL Flip doesn't suffer that much from treble loss when heard from an angle, while the Mini Jambox will sound rather dull, you cannot have it all! I also found the Mini Jambox to outplay the Sony X2, especially with enabled Liveaudio the sound coming out of the Mini Jambox was heavier and more impressive. I prepared a video with a direct comparison to the original Jambox. I think you can hear that the Mini Jambox sounds somewhat less stressed, especially at maximum volume the original Jambox shows obvious distortion, while the Mini Jambox stays pretty clean even with active Liveaudio, which becomes pretty distorted on the original Jambox. The only thing you might be missing from the Mini Jambox is high volume. So if you need high volume by all means, look somewhere else! I would have never paid the original asked price, but below 100$ the Mini Jambox might be quite a good choice for an ultraportable speaker. Although meanwhile there are lots of different options from other companies, none of them is really that small, and none of them sounds really that much better (except louder of course)! In any case the Mini Jambox is a big improvement over the old Jambox, which now gives an even more toyish impression. I am also finally going to sell my FoxL now, as it will be replaced with the Mini Jambox. The FoxL has still a surprisingly more refined sound although I was finally hoping for something that would outperform the FoxL. 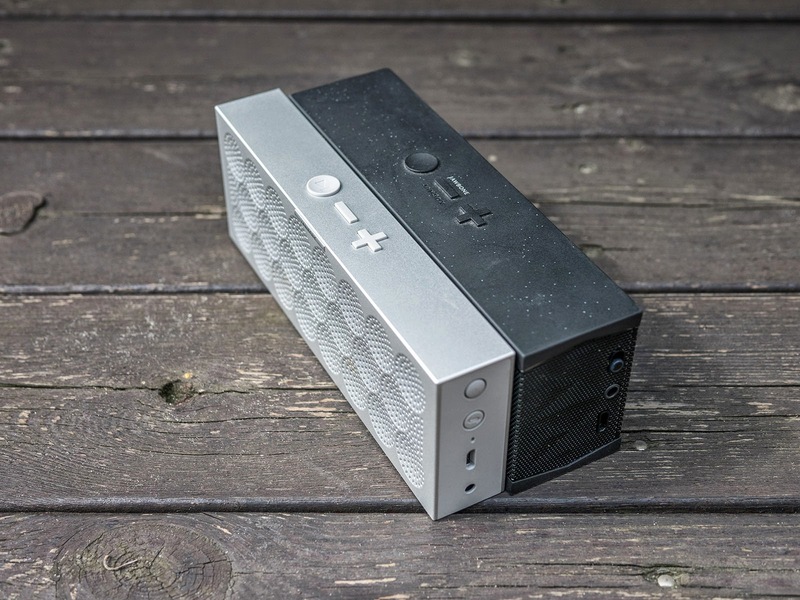 Nevertheless the Mini Jambox is the much better speaker with considerably better features, longer Bluetooth reach, better shielding against mobile radio and just better design, not to forget Liveaudio which really sounds great with the Mini Jambox now. Now I still hope for some similar sized model, which might add a bit more loudness and even better bass extension with all the nice features the Mini Jambox already offers now. By the way what about a "Soundlink Micro", Bose are you listening? Maybe such a small speaker from Bose will finally sound more balanced, as they probably won't be able to push bass as much! I wanted to contact you directly but I can't seem to find a way. I was wondering if you have made any close-mic frequency response measurements on any of these small Bluetooth speakers? By that I mean, measuring the response of the main speakers and passive radiator separately with the microphone very close to the driver. I think this would give some great insight as to how the overall sound is achieved. I have done this with a few cheap models that I own and used it to tune my own personal project a little better.